Gizmondo Delayed for Massive Redesign: Will Christmas Ever Be the Same? The six of you who have been following Gizmondo know that a new version was promised for this Christmas season. But surprise, surprise: it's been delayed due to economic instability and general crappiness. 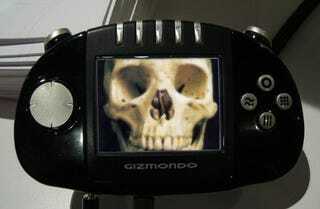 A Swedish blogger met up with Gizmondo founder Carl Freer to discuss the future of the scandal-ridden handheld maker. Freer admitted that the worldwide economic implosion forced most of his investors to drop out, and he's had to totally redesign the product. He plans to launch the new Gizmondo as an OEMed pocket PC, a bit like an HTC smartphone with gaming guts. It'll be focusing on downloadable games and other content, like Apple's App Store, and will come in two versions: Windows CE and Android. Since it'll be based on a smartphone design, it will also be a phone, but it won't come cheap.